KCB - The Full Story. What Gives A Crypto Value? Ultimately, the only thing that gives any cryptocurrency (coin) value is market support. That really is it. It is easy enough to wax lyrical about a great idea and its potential but you need people to want to get behind the coin, buy the coin and to believe that it will pay them back over and over for the investment made in it. As more and more institutional money comes into the Cryptocurrency ecosystem, this will help to separate the greats from the novelties. The focus of institutional money at first will, of course, be Bitcoin but it is what happens after that which keeps the new ideas flowing. There's plenty of money out there for more than just Bitcoin and, besides, Bitcoin has a very limited supply. Fundamentally, people as investors in Crypto want to see things they understand and the thing they want to clearly understand from the outset is "how does this make me money?" If they understand the rules of engagement, how long they need to wait, what the downside risk as well as the upside potential is, then they are more likely to see the coin as something they can get behind providing the rewards do have the potential to outweigh the risk. After all, we can't all get excited about the idea alone. Nowhere is this "potential" as evident as it is with the new cryptocurrency profit system being introduced by the Karatbank Organisation. The worlds first, fully licensed Crypto Bank has previously launched the Karatgold coin (ticker KBC). It sold out within weeks of launch and became the worlds biggest ICO (initial coin offering) and paved the way for phase two of the bigger plan. Phase two starts with the new Karatcoinbank Coin (KCB) which has a very simple profit formula. It directly benefits from the profits of the entire structure. Please watch this quick, 6 minute, video before moving on to buy KCB. The big picture is simple. Create a bank that actively deals in Crypto (done) and can, ultimately, easily move money between crypto and common fiat currencies. Then establish a crypto to fiat currency exchange with a difference, one that can not only convert crypto to fiat and vice versa but can also convert both to gold. Nobody else has this facility or is even yet working on it outside of the Karatgold Organisation. Now, for you to assess the value of where this project is going you need to have accepted that Cryptocurrency is now here to stay. Don't be mislead by all the popular press who keep banging the drum declaring the end of the Crypto bubble. It is all nonsense. If you understand how city money works you know that when the fat cats feel threatened they gang up on the threat and they have the media in their pockets. Also, name two markets that would definitely benefit during a stock market and property crash? Cryptocurrency and gold - and then make sure you get into both. Well, if you get into KCB you are into a vehicle that can be easily, at need, converted to gold and/or to other Cryptos and, when needed, back into GBP, EURO, USD and so on. There's a lot of money at stake for the fat cats if too many people get into Crypto and gold, so that's all you need to know about why they love to spread the rumours about Crypto going nowhere. To ensure a profitable supply of the finest gold, buy shares in a gold mine or two (done) and then have your own gold refining facility built (happening). All of this is taking place now within the Karatbank Organisation that has been built and developed by a rapidly growing company first established in 2011 to help ordinary people start to get back into gold. None of this is idle speculation. The bank exists, is fully licensed in Miami USA with branches of the bank also established in Singapore and Hong Kong. The Karatbars/Karatbank Organisation, in addition to Miami, Singapore and Hong Kong, has now established itself in Stuttgart and Dubai therefore truly establishing a decentralised presence across 4 continents. They have over 500,000 customers in over 120 countries and this is only the beginning. The gold mine shares have been purchased by Karatbank and they are now proud part owners of a huge mine in Madagascar with their share alone worth just under 1 Billion USD. The exchange is under construction with a launch target in October/November 2018. The new coin, the Karatcoinbank Coin (ticker KCB) gives us an opportunity to get behind the second Karatbank Crypto. This coin will become the fuel that accelerates the growth of the entire structure. 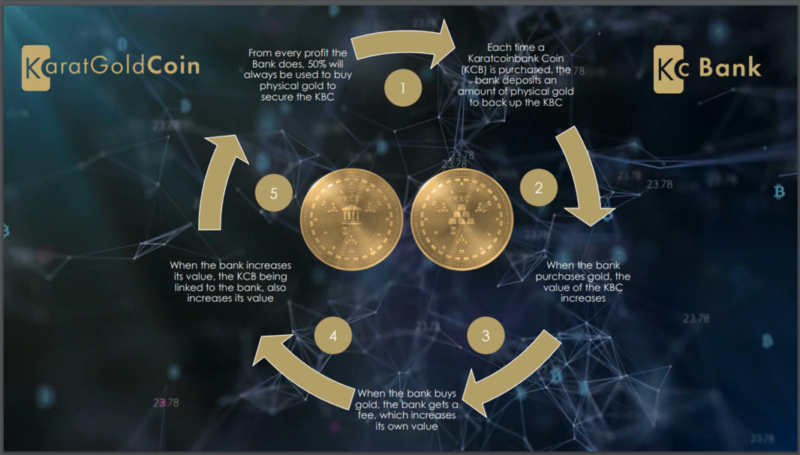 As money comes into the bank through exchange fees, ATM fees, Credit Card charges and other unique systems under development (including their own blockchain smart phone being developed in association with Sony), profits increase and this profit, in turn, increases the value of KCB whilst also accelerating the gold holdings for the original KBC coin which will also be another tradeable asset on their exchange. Like Shares In A Company? Think of KCB as you would think of shares in a company (they aren't shares but they act in the same way) and you get the idea of why owning some of the coin could generate impressive profits on the money invested. All in all, the entire process here is designed to cycle and increase profits for the entire organisation and those profits will be directly linked to the value of the new KCB coin. As the value of the bank and the entire organisation increases, the value of the KCB coin increases. Every fee, every profit making enterprise including the core sale of gold and Cashgold within Karatbank fuels the profit cycle. So now you can see that this Crypto is more than simply a bright idea. You can see for yourself how the profit cycle works in full when you visit the Karatcoinbank Coin (KCB) site by clicking the yellow buttons on this page. Finally, we have a Crypto that makes perfect sense and will grow in value based on an entire ecosystem built around it. It all starts with a plan to have the world's cheapest, highest quality 999.9 fine gold available for all to buy. They will achieve this through Cashgold, already becoming a big part of the gold trading scene. They will develop the first blockchain payment system based upon the transfer of real assets. These real assets will enable the development of their own exchange allowing us to move fiat currency into Crypto or into Gold and then from both Gold and Crypto back into fiat at need. And this is already under development and could even be live in early October 2018. The exchange will have lower fees than other exchanges and soon become one of the biggest exchanges in the market. Millions of dollars in fees can be made from a high quality exchange, especially one with the ability to trade between 3 assets classes digitally. The exchange will also deal in multiple other Cryptos including, of course, Bitcoin. Look at what Binance achieved. Within 6 to 9 months of launch they grew to become one of the top two exchanges in the world based on volume. Every transaction on the exchange earns a fee for them. They also introduced their own Cryptocurrency called the Binance Coin (BNB) which has a value of over $10 now and has been as high as $20. Imagine investing in KCB and seeing a $10 value within a year or two? Binance did this in less than a year. Karatbank will also offer credit cards and debit cards with lower than average fees. They will install a network of ATM's. Develop their own Smart Phone with built in instant access to the entire Karatbank network - not an app but a complete blockchain phone. They will continue to add to their gold mine assets and build their own gold refinery. A Company with a vision, embracing a new world of Blockchain and Crypto and mixing in a little of the old world with their financial interests in gold. Now who wouldn't want to be a part of that!